Ray Chopping (pic) on behalf of the British Legion, Natasha Shaw (pic) for Borough Green Primary School, Cllr Tim Shaw for the Parish Council, Sue Murray for Tonbridge & Malling Council, Cllr Steve Perry for the Polish Veterans, Taylor Rothwell for Village Businesses, and many others joining those laid last week by Tom Tugendhat MP, Borough Green Veterans, and Borough Green Scouts. Ray Chopping made the Exhortation to Remember. Cllr Mike Taylor spoke about how many of us have personal links to real people who served and died in Wars, but that personal connection is slowly fading, and we depend on today's young people to keep those memories alive, and carry them into the future. He recalled the WW1 Commemorative £2 coins given to those involved in building the War Memorial, and the ones buried in the foundations, and presented coins to representatives of young people at the Primary School and the Scouts. 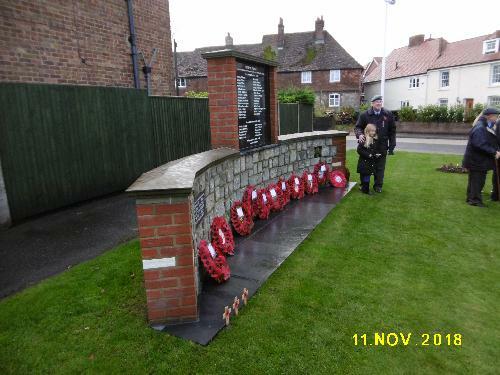 Cllr Tim Shaw then thanked Ray Chopping who had campaigned and built our War Memorial.